Neil McCafferty in action against Ballyclare Comrades. Oran Kearney has told Times Sport he is hopeful of adding another coupl e of players to his squad ahead of the new season. But the Bannsiders boss is cautious of stifling the development of his talented young squad. Oran Kearney enjoys the game on Saturday. 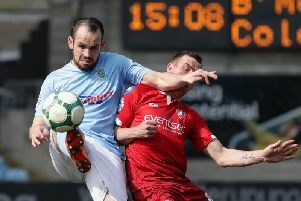 Speaking after watching his side rack up nine goals without reply in their opening pre-season game against Ballyclare Comrades on Saturday, Kearney said he is still working on deals. “I still would like to get a couple of more players in, but I don’t see me looking for much more than that because we’ve put so much work into developing the young players why would we turn our back on them now and go a different route,” he told Times Sport. Gareth McConaghie is Coleraine’s only new recruit to date as transfers within the League as a whole have been few and far between so far. “It’s normally Linfield who kick off the whole off season by releasing five or six players at the end of May, they get snapped up and then it starts a merry-go-round,” Kearney said. “But the Blues haven’t really shifted anything this summer so far. With that Crusaders moved a lot of players on in January so had nothing to move at the end of the season. “So the tarnsfer window has become a wee big stagnant. “Yes there’s a couple of players we’re interested in, but we’re reliant on their teams getting players in to replace them. “It’s going to be two possibly three maximum to come in as I don’t want to step on the young players’ toes, it’s important that we find the right mix. “Yes I think a couple of new faces would ignite the group again, but it has to be the right players for us. “I said to the players today that as much as the end of last season hurt us, if you zoom out and look at the season as a whole it was a success. “The young players are all a year older, they’ve another year’s experience under their belts, but I imposed on all the players that from the off today I wanted to see them go up another level again. “All the young players have had great learning in the league over the last couple of seasons but now it’s important we don’t become stagnant, we have to kick on again. “We finished fifth last season, yeah it was disappointing how it all panned out in the end, but we want to be in the mix again this season. Speculation is increasing that midfielder Ruairi Harkin may leave the club with Cliftonville known to be long-time admirers of the midfielder. Kearney wouldn’t be drawn on the future of any specific player saying he didn’t want to lose anyone from the squad. “Ideally we would love to keep what we have, but we know the nature of the beast and something may arise which we have to do,” he said.